Geothermal drilling is a core part of Teckna Group’s activities. As one of the leading specialist drilling companies operating in the ground source sector, we offer a full range of geothermal drilling services to ISO 9001:2015. Teckna Group provides a complete service when it comes to geothermal well drilling. From the installation of the connection pipework and manifold systems all the way through to testing of the pipework and the addition of heat loss fluid to the completed system. The specialised geothermal drilling rigs that we use are capable of operating in some of the most difficult strata. The geothermal drilling rig installs temporary steel casing whilst simultaneously drilling the borehole. The rigs use air, air-flush, water and mud flushing mediums up to depths of 200metres plus! If drilling in ideal ground conditions, geothermal drilling can be completed as quickly as 100 to 150 metres per day. As well as our specialist drilling equipment, Teckna Group also operates loop installation and grouting equipment. This allows the ground source loops to be installed without damage to the loop itself, easily and economically. The latest edition to Teckna Group’s geothermal drilling equipment is the duplex pump with high water flow. The duplex pump maintains a strong enough pressure for the cleaning of the borehole during the geothermal drilling process. To ensure that we provide an efficient service, all of our equipment is track mounted. This allows for easy manoeuvrability around the geothermal drilling project and makes for quick loading on and off-site. We operate specialised imported mud separation units that are sure to keep the project area as clean as possible. The mud separation unit minimises the fresh water used to ensure the separation of the drilling waste and the drilling water. This keeps the solids content for disposal to a minimum. As part of our professional installation, we operate to all the latest drilling standards, using reputable products sourced from within the UK from MGS. Teckna Groups geothermal drilling complies to the highest standard of marterials, workmanship and installation. 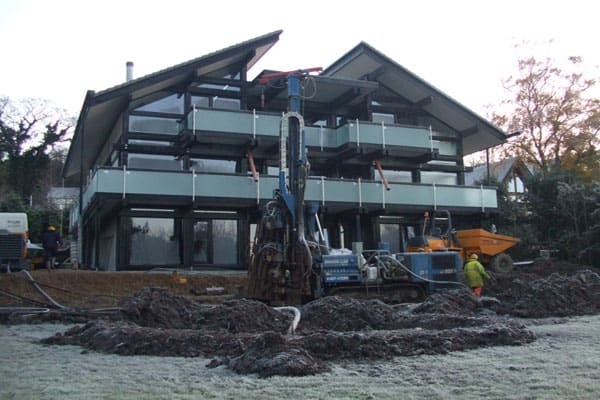 We work within the restrictions detailed by the Ground Source Heat Pump Association, British Drilling Association, Environment Agency and Microgeneration Installation Standards.